Over the years, it becomes more and more likely that your teeth will start becoming loose. Eventually, they may even fall out, making the foods you used to eat more difficult than before. However, losing a few teeth does much more than affect your diet. Many patients report changes in their appearance and their ability to do other tasks besides eating. According to your dentist in Tulsa, there is a solution for your mouth that’s worth investing in, especially for the long-term. To learn how dental implants can change your life for the better, keep reading. When your mouth is missing teeth, your mouth doesn’t have the same functions it used to. This is because the bone in your jaw is slowly resorbing back into your body. This occurs when teeth are no longer stimulating your gum tissue and blood flow is no longer flowing to the area. When a tooth is lost, it takes the roots with it. Dental implants act as this replacement root, allowing blood flow to continue. Additionally, people with missing teeth tend to report their facial tissue sagging more quickly. Dental implants work to maintain your face’s natural elasticity, so if you care about maintaining your youthful appearance, dental implants are a great investment. If you already wear dentures, then you’re probably familiar with what foods you’re able to eat without trouble and which foods you need to avoid at all costs. If you enjoy (or used to enjoy) tough foods that required a lot of biting force, such as steak or apples, then you’ll get to continue after getting dental implants. Dental implants are intended to function just like natural teeth, so as long as you practice proper oral care, there’s no reason you can’t indulge in your favorite foods. You just need to make sure you remove food particles from the gum tissue surrounding the implant, according to your dentist in Tulsa. 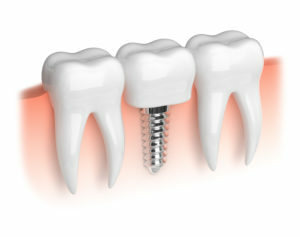 Did you know that dental implants in Tulsa are the only restorative solution that stimulates bone growth? This is because the implant is biocompatible, meaning it integrates well with your existing body tissue and bone. In fact, it goes through a process known as osseointegration, meaning it physically connects to your jawbone during the healing process after surgery. When your body is missing teeth, it can actually cause the surrounding teeth to move towards the empty space in order to compensate. This can cause your teeth to become crooked and negatively affect your bite, leading to other problems later. Dentures and dental bridges may aid your appearance, but only dental implants can restore the natural functions of your mouth. There are few things better to invest in than your oral health. Schedule an appointment with your dentist today to learn if dental implants are right for you! Dr. Angie Nauman knew she wanted to become a dentist since she was in 4th grade. After seeing what braces could do to straighten teeth, she became fascinated by all things related to dentistry. After graduating from dental school, she continued her pursuit of knowledge on many dental treatments, techniques, and technologies. To learn more about her dental implants and practice, contact her at (918) 254-8686 or visit her website.